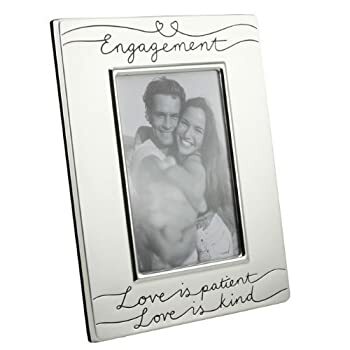 Modern and stylish Engagement photo frame, Measuring 22.5cm x 17.5cm (approx) and suitable for a 4" x 6" photo. Frame is aluminium having a brushed finish. The word "Engagement" is inscribed at the top with the words "Love is patient Love is kind" inscribed at the bottom.